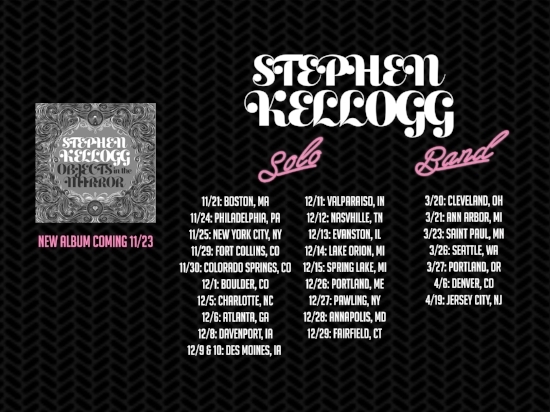 Lady Road has called me back again, and I'm thrilled to announce the first batch of dates I'll be playing in support of my new album, "Objects in the Mirror" (which comes out November 23rd, and can be pre-ordered through the Kellogg Family Store.) This is my favorite record I've ever made. It feels a bit like "Glassjaw Boxer", and as with GJB, I intend to play every song off the record live over the course of the tour (as well as plenty of old favorites.) I hope you'll get to hear every song on OITM. The first half of the OITM tour is one of supper clubs and listening rooms. I'll be playing solo and telling stories. The second half is in theaters and music halls. This will be a full band night of rock n' roll. This is going to be a big tour- a great tour. We will keep adding dates in the coming weeks, & we have a few we can't share just yet, but wanted to get the news to you. We will have Kelloggtown VIP upgrades available in most cities. I'll also be doing about a half dozen warm up dates starting in Los Angeles in just two weeks. I haven't been making too big a deal out of these shows because I'm gonna be trying some stuff out and debuting quite a bit of material. If you're awesome, and up for a bit of that experimenting... come be my neighbor! The OITM tour starts in earnest on November 21st in Boston, MA at the City Winery. Save the dates. Grab your friends. Line up your sitters. Let's celebrate that we are alive. See you later, see you so soon.